Fees associated with filing the industrial design application in Italy as well as other design fees are available in the fee calculator. The term for filing industrial design application in Italy claiming conventional priority is six months from the priority date. This term may be restored within two months from the expiration of a six-month time limit. To obtain a filing date, it is necessary to provide the Italian Patent and Trademark Office with the applicant’s data (name, address, nationality), drawings of the design (.jpeg format) and evidence of payment of the official filing fee. Multiple industrial design application is possible in Italy. The industrial design patent in Italy is valid for five years from the date of filing and may be further renewed for one or more periods of five years each up to a total term of 25 years from the date of filing. The Italian Patent Office carries out an examination verifying formal requirements of the Italian design application and other relevant substantial requirements. No examination of the novelty and individual character is conducted for the industrial design application in Italy. For confirmation of the right of priority, the certified copy of the priority application should be submitted within six months from filing the design application in Italy. If the certified copy of the priority document is filed in a language other than Italian, a translation into Italian is to be submitted to the Italian Patent Office within two months from the date of submission of the certified copy. Legalisation or notarization of the Power of Attorney is not required. It may be provided within two months from filing the industrial design application. 12 months from disclosure of the information about the industrial design before filing the application or priority date thereof, if any. For foreigners residing outside Italy or the European Economic Area (EEA), it is recommended to perform the design prosecution through an agent: a registered Italian patent attorney or a foreign lawyer provided that he has an address for service within the EEA. The appearance of the product resulting from the features of the shape, lines, colours, contours, texture or materials of the product or its decoration. 1. Online Search databases: Italian Designs, Community Designs (EUIPO), International Designs. 2. 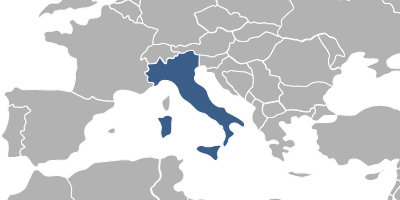 Industrial design registered in Italy via national procedure is valid in San Marino and vice versa. 3. Industrial design protection in Italy may also be obtained via registration of the Community Design.